Celebrating Our Virginia Master Naturalists! Brandon (and NLES Case Coordinator Kyle Fulk) recently completed the basic training class to become members of the Eastern Shore Chapter of Virginia Master Naturalists! We had a big party to celebrate! Here is Brandon with his family, the Stetars. Claudia Underwood from the Master Gardeners brought this beautiful passion flower for Brandon – an Eastern Shore Native! Sherry, Adrian and Maryann helping out. The Stetars and NLES Board Member TJ Johnson. Betsy Pinder joined us after the United Way Exercise Group. Megan Rose Jensen, Kyle Fulk, Brandon Cook, Peg Volk, and Barbara O’Hare from the Eastern Shore Chapter of Virginia Master Naturalists!! Amy, looking great in purple! Jason, with a great smile! We are so proud of Brandon & Kyle!! 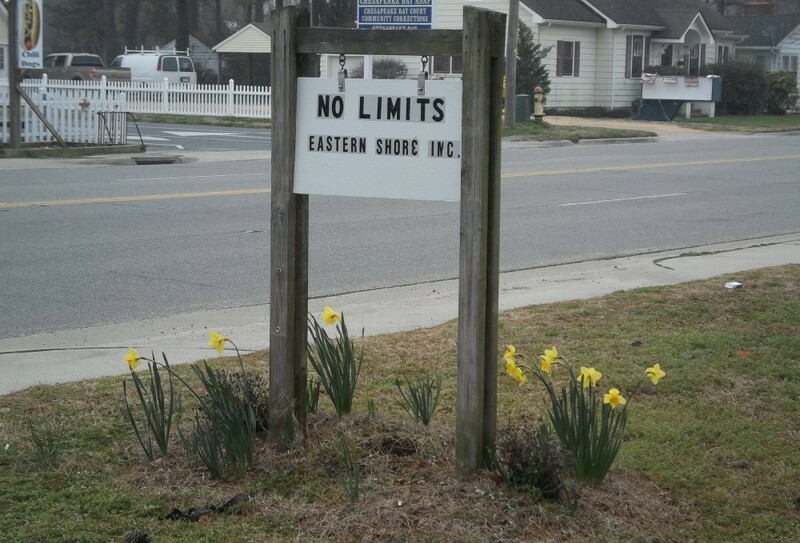 It is with a heavy heart that we announce the passing of our long-time friend and member of No Limits, Ricky Tyndall. Ricky was a wonderful and kind man. We will miss him so very much and may he rest in peace. According to Ricky’s obituary found in the Eastern Shore Post, memorial donations may be made to the Parksley Volunteer Fire Company, P.O. Box 14, Parksley, VA 23421 and any memory tributes may be shared with the family at http://www.williamsfuneralhomes.com. Ricky with Jackie at the old No Limits building in Onancock. Ricky and friends on an outing to pick blueberries with No Limits. Matt and Rachel had to run an errand across the bay this week and had a nice time! Matt enjoying a sweet treat before heading home. Kyle and Brandon working HARD on their Eastern Shore Master Naturalist final exam. Congratulations again on your recent graduation y’all! Amy with her brand new voting ID. She is ready to go vote! Kamesha from the Virginia Cooperative Extension came in to give a lesson on nutrition this week! Part of our lesson was on Yogurt Parfaits. Amy and Sherry say they enjoyed this lesson! David, Corina, and Jason liked the lesson as well. Don’t mind CL’s face though, he just doesn’t like yogurt at all! Zel and Amy working on a memory match game while waiting for the bus! Congratulations to the 2018 Class of Eastern Shore Master Naturalists! We are proud to announce that long-time member of No Limits, Brandon, as well as our Case Coordinator, Kyle Fulk, have completed the 2018 Eastern Shore Master Naturalist Course! Brandon posing for a picture during a class outing. A class on the many soil types found on the Eastern Shore. Brandon and Kyle working with their peers during a class activity. Brandon presenting his project to the 2018 Eastern Shore Master Naturalist Class. He presented on the only cactus native to Virginia, the Eastern Prickly Pear! Brandon receiving his certificate with Dot Field, Natural Areas Research Coordinator and Eastern Shore Region Steward, who assists in operating the Eastern Shore Master Naturalist Program. Kyle receiving his certificate with Dot. Graduates of the 2018 Virginia Eastern Shore Master Naturalist Course! Congratulations to Brandon, Kyle, and all other graduates of the 2018 Eastern Shore Master Naturalist Course!